These days it is not uncommon for people to shift abroad for work. We discuss some things that you must do before leaving the country to keep your finances in order . Remember to convert your savings account into a non-resident ordinary (NRO) account. Non-resident Indians, or NRIs, can deposit their Indian income such as rent, dividend and pension into NRO accounts and make payments. Also, some banks offer a sweep-in facility, under which any amount above a threshold is put into a fixed deposit that earns higher interest. Check for this in case you are expecting some cash inflow in your account. This will help you earn higher interest than from the savings account. Also, consult your financial advisor to understand tax implications. Also, it is important to clear your short-term debts and surrender all credit cards. In case you have a large debt, for instance a home loan, shift to the auto payment mode so that the payment of monthly instalments is not affected. 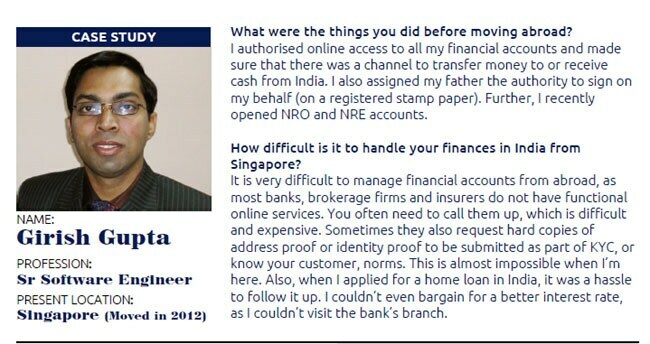 An NRE account is an external savings bank account for NRIs. Since it is an external account, the money deposited can be taken outside the country. In other words, the money is fully repatriable. So, if you want to invest your money earned abroad in India and want this money back after some time, you will have to open an NRE account. The account can help you transfer funds freely between India and the country where you plan to live. The interest earned on money in the NRE account is not taxed in India. 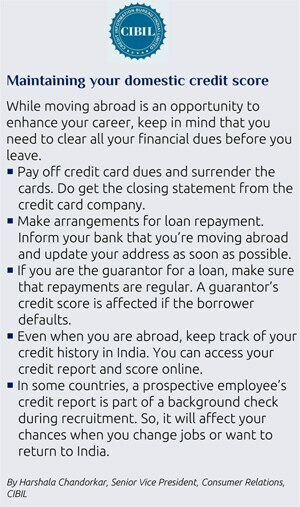 Kapil Narang, chief operating officer, Ameriprise India Advisory Services, says, "Always consider the real cost of moving and living abroad while evaluating your expenditure." The expenses that will arise before moving out relate to visa, legal clearance, long-distance shipping and travelling. After reaching your destination, you may have to make big-ticket purchases such as cars and furniture too. "Another essential to consider is securing an emergency fund, which should be six-seven months of living expenses," he says. In case you have an endowment plan, you can continue the policy and set the auto debit mode in your bank account so that the premium payments are not delayed. However, for term insurance plans, you must check if your insurer provides the cover in the country you are relocating to. If not, you should surrender the policy and buy a fresh term plan abroad. It is best to surrender the existing health policy and buy a new one in the country where you are shifting. Health and medical care regulations vary from country to country. For instance, certain countries demand the proof of vaccinations you have taken as a child. You should make sure that all your financial assets have nominees. Anil Rego, chief executive officer and founder, Right Horizons, says, "A nominee is important as in the event of any unfortunate incident the fate of your financial assets will be uncertain in the absence of any person who can lay claim to them." NRIs can invest in Indian stock markets under the portfolio investment scheme (PIS) of the Reserve Bank of India (RBI). An individual can open only one PIS account for buying and selling stocks.The PIS account is only for NRIs and not for resident Indians. It is only for trading in Indian equities and not mutual funds. Keep your financial data like credit cards, user names and passwords secure so that these can be accessed at a later date. Adhil Shetty, chief executive officer, BankBazaar.com, says, "Make arrangements with the bank or with people who might stay behind regarding physical bank statements and credit card bills. Otherwise, activate email options for these. Also, inform your banks, mutual funds, credit card companies and insurance companies about the change in the communication address and activation of online requests."